Bell was rung thirty-three times at Jogyesa Temple, the chief temple of the Jogye Order of Korean Buddhism, a day before the historical inter-Korea summit. Ven. 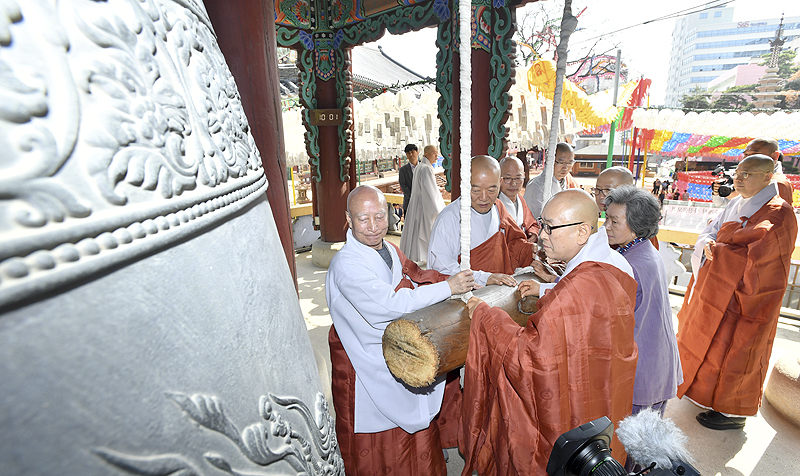 Seoljeong, the President of Jogye Order rang the bell thirty-three times to pray to the Buddha for a successful intra-Korean summit along with monks in his leadership at Jogyesa Temple on April 26. Before the ringing of the bell, Ven. Seoljeong gave opening remarks which contained the all citizens’ sincere wish for successful summit. He also stated that “Buddhist followers affiliated to Jogye Order has also prayed for the summit for the entire week. Temples all around the country will be ringing the bells on the day of the summit as well.